My station setup for this event was later than planned. My original summit was to be VK2/ST-042 and to get access a phone call to the owner of the access road is usually all that’s required. However after two phone calls getting a voicemail response and no callback, I decided to go to Bobbara Hill, just west of Binalong, although that required a longer walk time as well as an extra 20 minutes of travel time. Once I left the car, opened and closed the gate and starting to walk along the track leading to the hilltop, I was surprised by the wind strength even on the valley floor. As I climbed further I found the wind was even stronger on the hilltop. 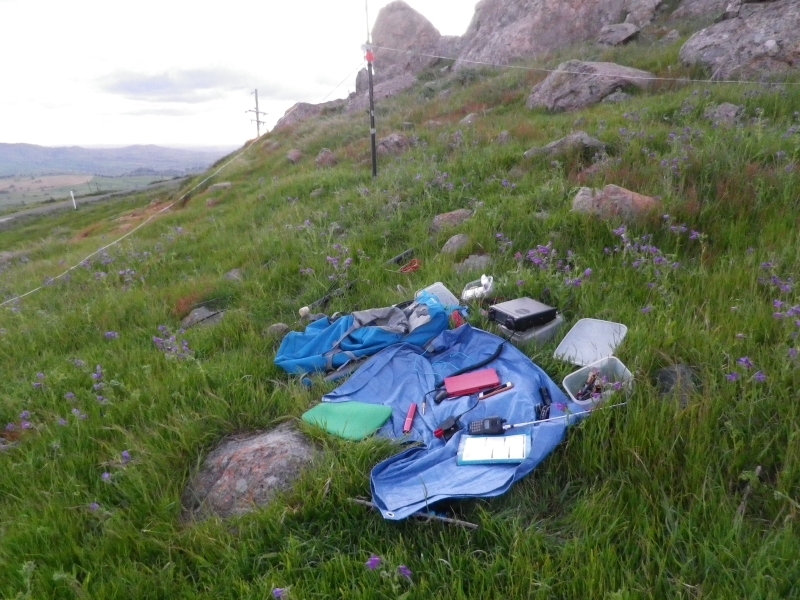 I started setting up in the eastern side of the hill which happily allowed me to avoid the wind, but when I lifted the antenna pole up into the wind it was being blown around so vigorously in the turbulence that I decided it had no chance of surviving in that position and I moved everything further around to the east side of the mountain. More delay. Finally I got on the band and called cq on cw, then worked 12 contacts, many being S2S. I tuned around for ssb activators but apart from Don M0HCU didn’t hear many. I did call some but lost out to Europeans. Looked for Ed DD8LP lower in the band where he was spotted but nothing there. Twice the pole collapsed mid-contact. Very difficult especially on a slope and in that wind. I forgot to spot myself but while the contacts are coming you don’t need more qrm. I have a 250 hz filter in the 703 but that wasn’t narrow enough to sort through the signals at one stage. Have to say my sending was affected by the unseasonably cold temperatures, not sure exactly what the temp was, but less than 10C, possibly down to 6C or so by the time I finished. Others were making mistakes too. 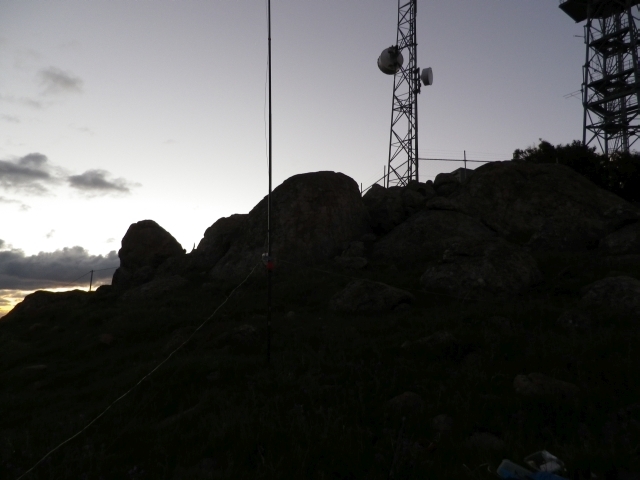 I worked 12 contacts, DL3TU, VK4BJS, HB9FVF, OK2PDT, DL3HXX, DL4CW, HB9DQM, OE5AUL, CT7AGR, HB9AFI, JP3DGT and M1EYP just after sunset. Thanks to all. The surprise was to finally work Tom M1EYP as my last contact and then I looked up and realised the light was fading fast so I packed up. Walking back down the hill, I was in near darkness as I approached the car half an hour later. The next morning I received an email from CT7AGR, Portugal, a very nice message thanking me for the contact. I was just relieved to make the 12 contacts I did including 8 as Summit to Summit (s2s). Update: received another email re the S2S contacts. S2S are the most desirable of all the sota contacts.